The first Ohana: Luau at the Lake is already fading into memory but some great news just came into the Ipu Ki news hut: there will be a second Ohana in 2010. The survey results are in from the 2009 attendees and two things stood out clearly. First, everyone loved Lake George and wants to experience it in season when more attractions are open. Second, people want warmer weather so they can use that Tiki Motor Inn pool while the bands play. You asked, we listened. 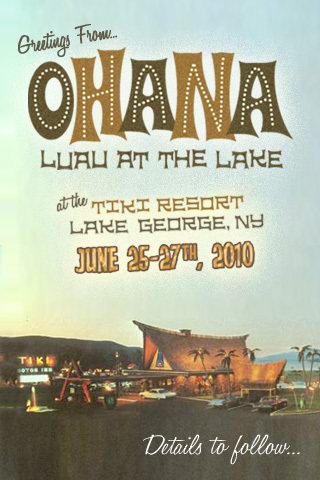 The Ohana team has worked with the staff at the Tiki Motor Inn to reserve the entire resort for a summer weekend that also offers competitive room rates and we are very excited to tell you that Ohana: Luau at the Lake 2010 will be held Friday, June 25 to Sunday, June 27. There is a lot of work to be done but you can expect another fantastic three-day weekend and some unexpected surprises in Lake George. Stay tuned to Ipu Ki for more details soon!